Hair testing is a process in which hair specimens are analyzed for illegal drugs. When a drug is ingested, it enters the blood stream and is broken down to a specific metabolite. When a hair sample is screened, both the parent drug and the metabolite are isolated. Any samples that screen as potentially positive are confirmed using state-of-the-art GC/MS (Gas Chromatography/Mass Spectrometry) technology. In order for a hair sample to test positive, the metabolite of the drug will be detected if the donor has physically ingested the drug. Our Laboratory uses detection levels that follow government recommendations. For a detailed information about Hair Testing, see information at the bottom of this page as well as our Detailed Hair Drug Test FAQ section. Hair Confirm Drug Test - this is a "do it yourself" hair drug test, simple to use, quick, on-line results. This Hair Drug Test uses the same lab as our professional test below, but it is much easier to use! Laboratory Hair Drug Test - for professional drug test collection. Requires collector certified in hair drug test collections (see below). When compared to other forms of testing (urine, blood, oral fluids), hair samples can detect a longer period of drug use. For example, urinalysis can only detect most drugs within 2-3 days of use with the exception of marijuana, which may be detected for a longer period of time. After this period, a donor will be free of the drug, test negative and slip through the screening process. This is important in pre-employment testing where most candidates are aware that a drug test might be required and can abstain accordingly. With hair samples, the only time limitation for detecting drug usage is imposed by the length of the donor's hair. The industry standard is to test 1.5 inches of head hair for a 90 day history. Why is hair testing the best method of detecting substance abusers? Hair testing offers the longest window of detection (90 days standard test - using 1.5 inches of head hair). Body hair can reveal drug use for up to one year! Hair specimens cannot be adulterated or substituted. Collection is safe and simple - without the hazards associated with the handling of body fluids. Pricing is competitive with other methods even before the potential costs of employing a drug user are considered. Pros: This method has the longest drug detection window. For the majority of drugs the window of use is about 90 days or more. This method is also very donor friendly. Adulteration is the hardest to do with this method. This test is also very dependable and accurate. Cons: The biggest disadvantage to this method is that you have to have a lab run the test and obtain the results. Because of this extra step, it can take a few extra days to get your test results. Another disadvantage is that it most likely will not pick up very recent drug use. Hair test kits are also the most expensive drug test kits because of the necessity of using a lab for the testing. Since hair growth is fed by the bloodstream, the ingestion of drugs of abuse is revealed by analyzing a small sample of hair. Our testing method measures the drug molecules embedded inside the hairshaft, eliminating external contamination as a source of a positive test result. Hair testing results cannot be altered with shampoos, bleaches or other external chemicals. What drugs are included in a standard Hair Drug Test? Cocaine (cocaine & benzoylecgonine), marijuana, opiates (Codeine, Morphine & 6-monacteyl morphine), methamphetamine, (Meth/amphetamine & Ecstasy), and phencyclidine (PCP). These are the five drug classes are mandated for testing by the Federal Government. What time period does a standard test cover? A standard screen covers a period of approximately 90 days. The hair sample is cut as close to the scalp as possible and the most recent 1.5 inches are tested. How effective is Hair Testing in detecting drug users? In side-by-side comparison studies with urinalysis, hair drug testing has uncovered significantly more drug use. In two independent studies hair drug testing uncovered 4 to 8 times as many drug users as urinalysis. Studies indicate that head hair grows on the average approximately 1.3 cm (or 1/2 inch) per month. This growth rate varies slightly (estimated at .2 cm per month, consequently there is some (1 week) time variation possible. of hair or approximately 90 to 120 strands. The thickness of different types of head hair (thick brown vs. thinning gray) is the reason for this variation. How does Hair Testing compare to urinalysis? inability to tamper with the test. Cocaine, methamphetamine, opiates and PCP are rapidly excreted and usually undetectable in urine 72 hours after use. The detection period for hair is limited only by the length of the hair sample and is approximately 90 days for a standard screen. At this time there are no known adulterants for hair tests. 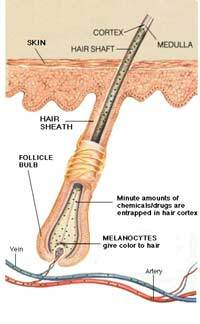 Since hair tests analyze the drugs inside the hairshaft, external contaminants/chemicals have no effect. Additional advantages include non-intrusive collection procedures, virtual elimination of test evasion; greater accuracy through test repetition capability. 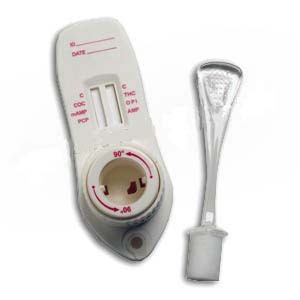 The combination of an increased window of detection and resistance to evasion makes Hair Testing far more effective than urinalysis in correctly identifying drug users. It takes approximately 4-5 days from the time of drug use for the affected hair to grow above the scalp. Body hair growth rates are generally slower and cannot be utilized to determine a timeframe of drug use. What is the shortest time period that can be accurately evaluated? The minimum time period is approximately one month (1/2 inch). Body hair can be used if head hair is too short for a test. If body hair is used the timeframe represented by the test is approximately one year, due to the different growth pattern in hair below the neck. Hair can be collected from several head locations and combined to obtain the required amount of hair. In addition, body hair may be used as a substitute to head hair. In the rare case where no hair is collectable, complete urine/adulteration testing may have to be utilized. Does body hair give the same type of results as head hair? Yes, body hair can be used to test for the five standard drug classes, though body hair growth patterns are different than head hair. Most body hair is replaced within approximately one year. This means a test done with body hair will be reported as drug usage during approximately a one year timeframe. Yes, but the test will be reported as having an "anonymous" donor. We cannot attribute the sample to any specific person and we cannot determine the timeframe of the test, so the test result is not legally defensible. The test will only report that the sample submitted had the reported drug metabolite components. How does Omega Laboratories establish its cut-off levels? Omega follows the cut-off levels generally accepted industry-wide and recommended by the U.S. Department of Health & Human Services. Does Omega Laboratories perform GC/MS confirmation of all positive hair results? Yes. Omega provides confirmation utilizing GC/MS for all specimens that screen potentially positive (opiates, PCP, methamphetamine, cocaine and marijuana). Can Hair be affected by cross-reacting substances such as over-the-counter medications? Enzyme-immunoassay antibodies (EIA), similar to those used to test urine, are used for the initial screening test for drugs of abuse in hair; therefore the potential for substances such as over-the-counter medications to cause a false positive screening result does exist. To provixe accurate results Omega confirms all positive results by GC/MS. Does external exposure to certain drugs, like marijuana or crack smoke, affect the Hair Test results? Omega testing looks for the metabolite by-product of drug ingestion that is deposited inside the hairshaft by the bloodstream. For example, to rule out the possibility of external contamination for marijuana smoke creating a false positive, Omega reports a positive result only when it detects the metabolite (i.e. THC-COOH) . This metabolite is only produced by the body and cannot be an environmental contaminant. Is Omega Laboratories' internal chain-of-custody comparable to a urinalysis laboratory test procedure? Omega's internal chain-of-custody is modeled after the requirements in the SAMHSA guidelines. How long are positive and negative test reports kept on file? Test reports are retained for a period of three years or as mandated by law. What is done with the excess hair that is not tested? The hair not used from the time period being tested (i.e. three months equals 3.9 cm) is stored in the chain-of-custody sample acquisition pouch. Negative hair is stored for three months. Positive hair is stored for one year. What experience does Omega Laboratories have provided Expert Witness Testimony? Omega Laboratories' forensic experts have qualified as expert witnesses in Ohio, New York State, California, Texas, Nevada, Oklahoma, Alabama and Arizona in over 250 civil, criminal, and Superior Court trials. What other drugs are available to be tested in hair analysis? Currently, nicotine, methadone, simple benzodiazepines, tricyclic antidepressants assays and mescaline have been detected in hair. However, many details such as cutoff levels and dose response relationships have not yet been established for these compounds, though, detection of these compounds is possible by special arrangement with the Laboratory.